God’s Spirit is living among God’s people. He always was, always is, and always will be. These are the stories that tell about him and what he does. 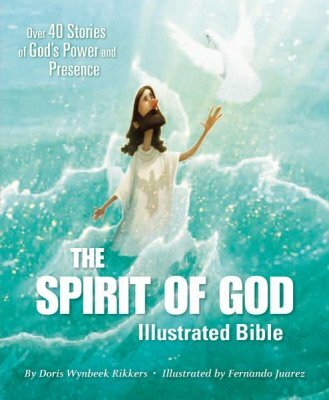 The Spirit of God Illustrated Bible, written by Doris Rikkers and illustrated by Fernando Juarez, presents over 40 Bible stories from the old and new testaments that show how God’s Spirit has been with his people from the beginning of time. Keep reading to learn more about this new release from ZonderKidz! moving text by Doris Rikkers. With a cover that sparkles and shines with foil, this is a special storybook Bible that will appeal to both children and parents alike. You can also enter to win a copy of The Spirit of God Illustrated Bible and other awesome kids' releases in a giveaway hosted by Read with Audra. 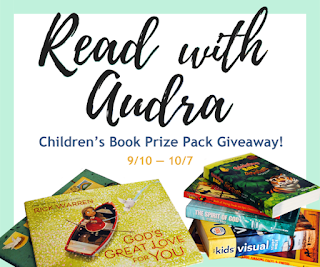 Enter to win the prize pack here! I believe that kids should be taught about Jesus at a very young age. If they grow up praying and reading verses, chances are they will want to continue with that as they get older. Curl up together with your kids and experience the Bible in a fresh, new way with The Spirit of God Illustrated Bible. Young children will enjoy reading the different Bible stories and seeing the illustrations that capture the moments. The Bible is divided into two sections - the Old Testament and the New Testament. Each of the stories tells where the original accounts can be found in the Bible and each of the stories includes a verse from that book in the Bible. Each story is told in a way that is understandable to children. This is a nice book to start young children off with when first teaching them about Bible stories and characters.